Chances are you may know someone. Your sister. Your friend. Your mother. Your neighbor. Perhaps even yourself. There are few of us who haven’t been touched by Breast Cancer. This year alone there will be an estimated 266,000 additional cases of breast cancer diagnosed. This is the month that so many people stand up and take notice. We wear a pink ribbon. We participate in a charity event. We are more diligent about our breast self-exams. You may be asking yourself, how else can I help raise awareness? We have been asking ourselves that, too. As a female owned business, this is a topic that is very important to us. All of us hope to find a cure for Breast Cancer and we want to do our part. During National Breast Cancer Awareness Month why not show your support for pink by wearing it in your hair? 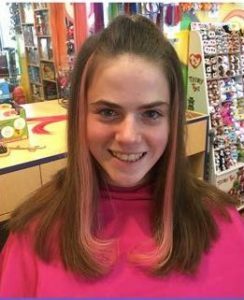 At all 8 of our family hair salons in the Chicagoland area we will be offering $10 pink hair extensions and $2 temporary pink hair stripes. 100% of the proceeds will go to help find a cure for Breast Cancer. It’s a fun way to change up your look for a great cause. Why not have your kids take part as a family experience? 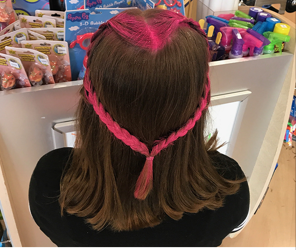 From braids to stripes– pink hair can show you care!